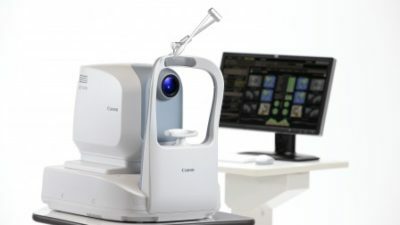 The OCT-HS100’s extensive automatic functions simplify and optimise examinations of the layers of the eye. Optical Coherence Tomography (OCT) utilises high speed scans of the eye to examine and assess each layer of the retina and optic nerve head in fine detail. 70,000 A-scans/sec results in very highly detailed images of the eyes in a very efficient amount of time, giving vital information as to the health of the eye. The OCT utilises near infrared light to capture detailed images of the individual layers of the back of the eye, allowing earlier detection of suspected ocular conditions.